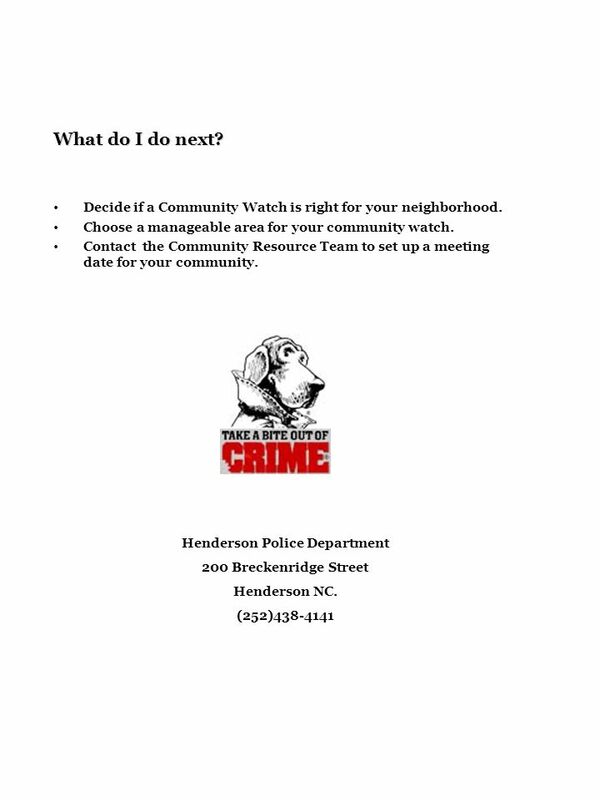 A Guide for Neighborhood Leaders Henderson Police Department Lt. Irvin W. Robinson Crime Prevention 200 Breckenridge Street Henderson NC. (252) 431-6061. 3 What is a Community Watch? Community Watch, Neighborhood Watch, Block Watch, Town Watch, Crime Watch - whatever the name, its one of the most effective and least costly ways to prevent crime and reduce fear. A community watch fights the isolation that crime both creates and feeds upon. It forges bonds among area residents, helps reduce burglaries and robberies, and improves relations between police and the communities they serve. 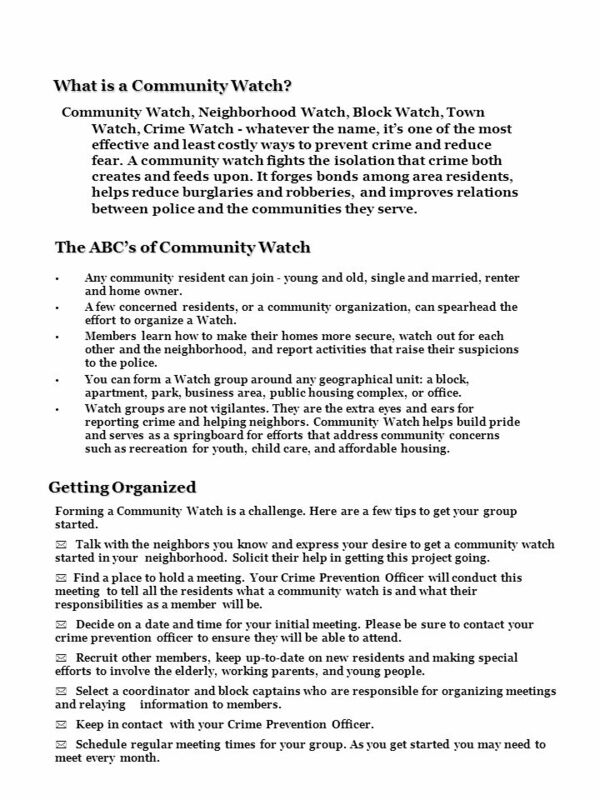 The ABCs of Community Watch Any community resident can join - young and old, single and married, renter and home owner. A few concerned residents, or a community organization, can spearhead the effort to organize a Watch. Members learn how to make their homes more secure, watch out for each other and the neighborhood, and report activities that raise their suspicions to the police. You can form a Watch group around any geographical unit: a block, apartment, park, business area, public housing complex, or office. Watch groups are not vigilantes. They are the extra eyes and ears for reporting crime and helping neighbors. Community Watch helps build pride and serves as a springboard for efforts that address community concerns such as recreation for youth, child care, and affordable housing. Getting Organized Forming a Community Watch is a challenge. Here are a few tips to get your group started. 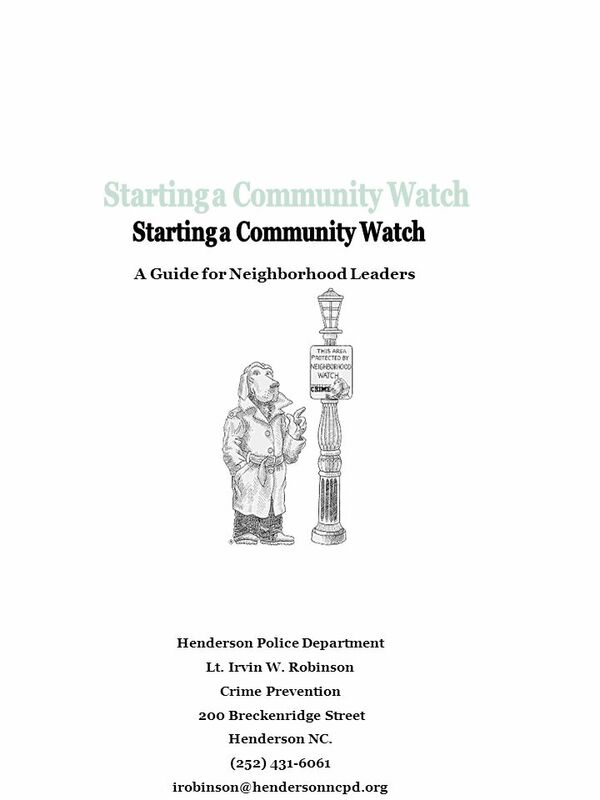 * Talk with the neighbors you know and express your desire to get a community watch started in your neighborhood. Solicit their help in getting this project going. * Find a place to hold a meeting. Your Crime Prevention Officer will conduct this meeting to tell all the residents what a community watch is and what their responsibilities as a member will be. * Decide on a date and time for your initial meeting. Please be sure to contact your crime prevention officer to ensure they will be able to attend. * Recruit other members, keep up-to-date on new residents and making special efforts to involve the elderly, working parents, and young people. * Select a coordinator and block captains who are responsible for organizing meetings and relaying information to members. * Keep in contact with your Crime Prevention Officer. * Schedule regular meeting times for your group. As you get started you may need to meet every month. 4 What makes a Successful Community Watch? Typically, Community Watch groups organize to respond to an immediate threat - a sharp increase in burglaries, or auto thefts, rising fear if street crime. Often, when the crisis is resolved, membership and the commitment to the Watch start to fade away. After all, why keep looking out for criminals if theyve been arrested or gone elsewhere? This short-sighted attitude ignores key benefits of the contemporary Community Watch - a Watch group empowers people to prevent crime, forges bonds between law enforcement and the communities they serve, and builds a foundation for broader community involvement. Community Watch is far more than a quick fix for an immediate crisis - it can be a moving force for positive changes that tackle root causes of crime. 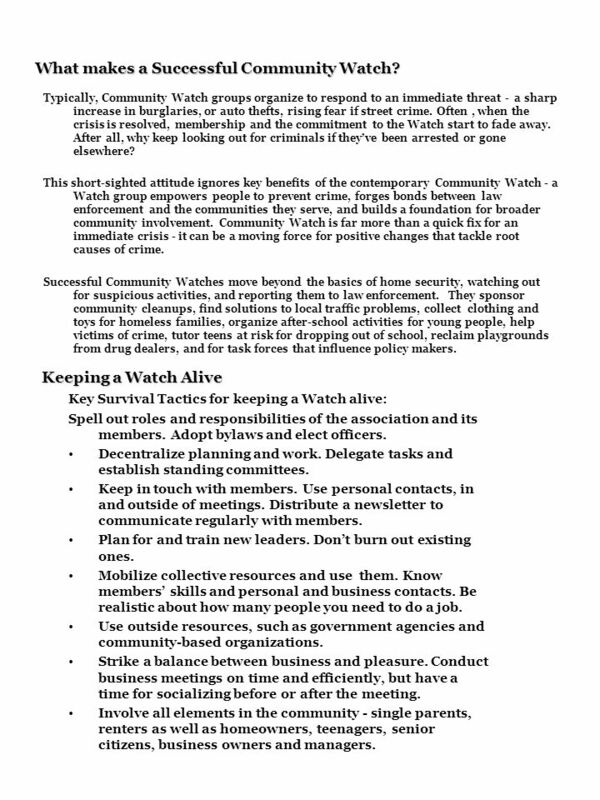 Successful Community Watches move beyond the basics of home security, watching out for suspicious activities, and reporting them to law enforcement. They sponsor community cleanups, find solutions to local traffic problems, collect clothing and toys for homeless families, organize after-school activities for young people, help victims of crime, tutor teens at risk for dropping out of school, reclaim playgrounds from drug dealers, and for task forces that influence policy makers. Keeping a Watch Alive Key Survival Tactics for keeping a Watch alive: Spell out roles and responsibilities of the association and its members. Adopt bylaws and elect officers. Decentralize planning and work. Delegate tasks and establish standing committees. Keep in touch with members. Use personal contacts, in and outside of meetings. Distribute a newsletter to communicate regularly with members. Plan for and train new leaders. Dont burn out existing ones. Mobilize collective resources and use them. Know members skills and personal and business contacts. Be realistic about how many people you need to do a job. Use outside resources, such as government agencies and community-based organizations. Strike a balance between business and pleasure. Conduct business meetings on time and efficiently, but have a time for socializing before or after the meeting. Involve all elements in the community - single parents, renters as well as homeowners, teenagers, senior citizens, business owners and managers. 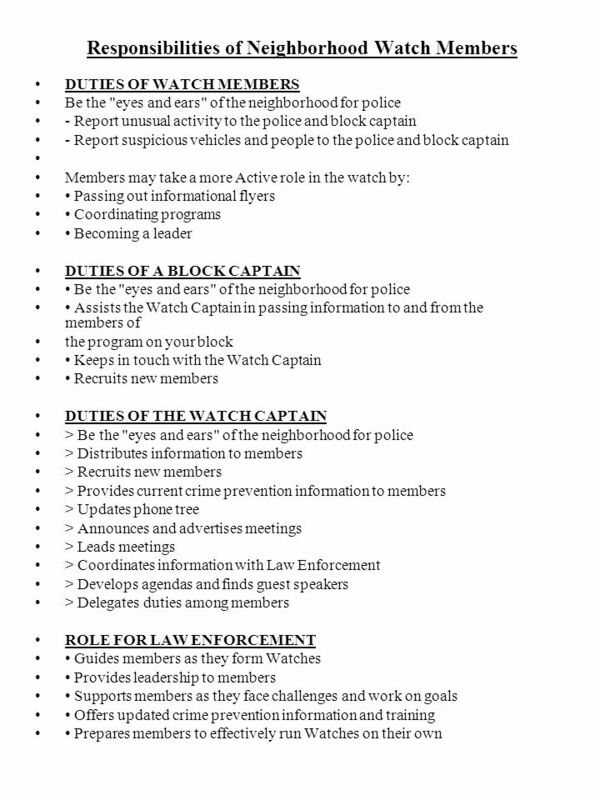 Download ppt "A Guide for Neighborhood Leaders Henderson Police Department Lt. Irvin W. Robinson Crime Prevention 200 Breckenridge Street Henderson NC. (252) 431-6061." Neighbourhood Watch Poland: DIALOG Programme experiences. ALABAMA WALK Featuring THE WALKING SCHOOL BUS Program Guide Neighborhood School. Organization LaVista Park Civic Association DeKalb County Neighborhood Watch Programs LaVista Park Security Patrol. NEIGHBORHOOD WATCH PROGRAM History Neighborhood Watch is undoubtedly one of the oldest and most well known crime prevention concepts in history. While. Interviewing Police Officer: Heather Kelly Interview Conducted By: Elizabeth Tapia. STREET GANGS A Growing World Plague LAS BANDAS CALLEJERAS Epidemia que Asola al Mundo. Durham Police Department Neighborhood Watch Organizing a Neighborhood Watch Program By Officer P.S. Stewart. Neighborhood Watch John E. Williams, CPS Certified Crime Prevention Specialist Beavercreek Police Department. 3/2004NAMB Church Preparedness1 Church Disaster Preparation. Partners Bureau of Justice Assistance, Office of Justice Programs, U.S. Department of Justice National Sheriffs’ Association. Texas A&M University – Kingsville POLICE DEPARTMENT Integrity Accountability Commitment. Neighborhood Crime Watch. What is Neighborhood Watch? Group of neighbors who: 1.identify and report criminal activity to the police. 2.promote crime prevention. Partnerships For A Safer Community Presentedby Presented by Neighborhood Watch Program. Steve Mimbs Chief of Police. Crime Prevention Community Relations Division Jane Meier Neighborhood Watch First Meeting.